Valtteri Bottas handing the race lead - and the victory - to Lewis Hamilton in the 2018 Russian Grand Prix wasn’t the first time team orders decided the winner of a race, and it won’t be the last, either. We take a look at 10 other occasions where drivers were leading but, whether through team orders or a gesture of goodwill, decided to let their teammate go on and take the victory. Riccardo Patrese was very much Nigel Mansell’s number two driver at Williams, something that was blatantly obvious at Magny-Cours in 1992. Mansell started from pole but Patrese took the lead at the start and stayed there until the race was stopped for rain after 18 laps. At the restart, Mansell tried to pass his teammate, but Patrese fought back and retained the lead. At the end of the lap, Patrese waved Mansell ahead of him. Had the team order come through? Patrese wouldn’t comment after the race, but it had looked pretty obvious - even though Mansell was miles ahead of anyone (including Patrese) in the championship. 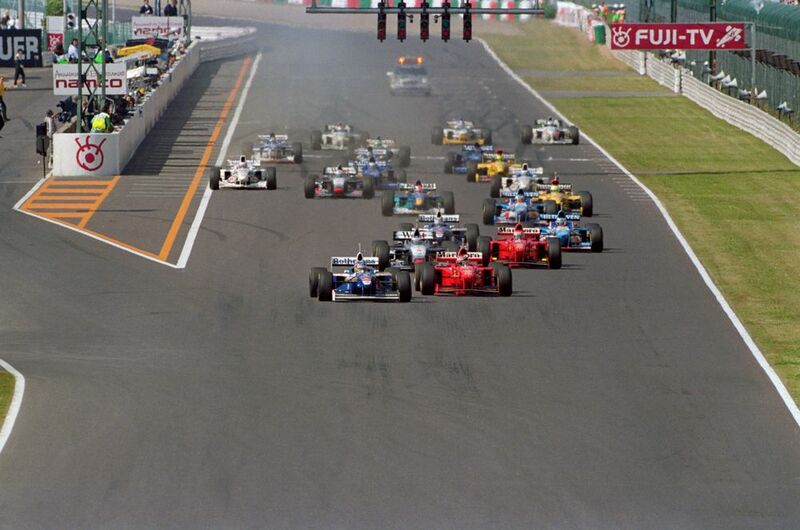 At the start, Jacques Villeneuve retained his lead and then drove incredibly slowly in the hope that someone behind him would pass title rival, Michael Schumacher. 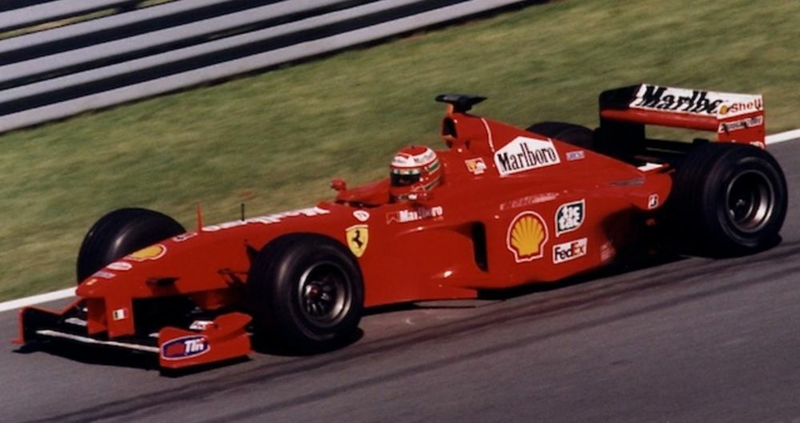 Ferrari had predicted this and fuelled Eddie Irvine light - he almost immediately swept passed Mika Hakkinen and Schumacher to run second, and a couple of laps later passed Villeneuve to take the lead. Villeneuve continued his tactics of backing the pack up as Irvine shot into a massive lead. During the pit stops, Schumacher managed to jump Villeneuve and with Ferrari now running one-two, Irvine soon dramatically slowed down to let Schumacher take the lead and the victory. McLaren was so ridiculously far ahead of everybody at the first race in Australia that no other team managed to finish on the same lap. Hakkinen had led pretty much the entire race, but late in the race came a bizarre moment when he entered the pits and simply drove through the pit lane without stopping. That left Coulthard in the lead until a few laps from the end, when he slowed on the pit straight and allowed his teammate back through into the lead. 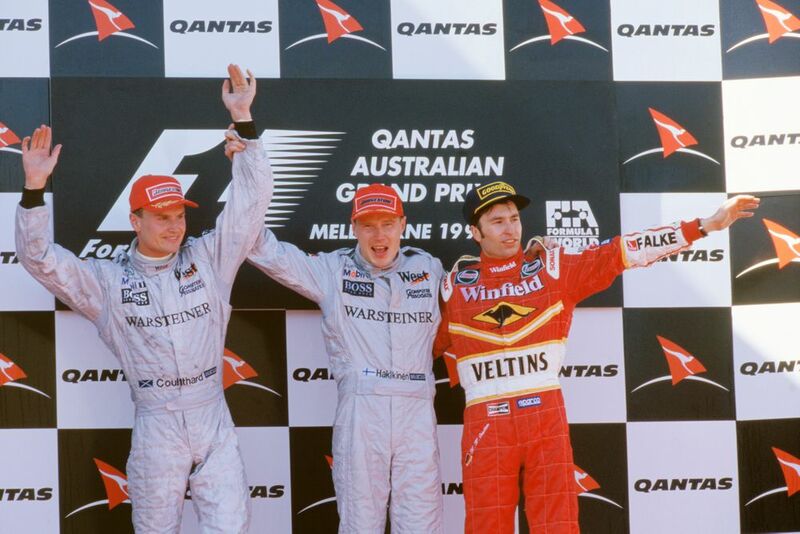 It seemed like a slightly ridiculous decision given that it was the very first race of the season but Coulthard said afterwards that it was the result of a pre-race agreement that whoever led the first lap (in this case Hakkinen) would be allowed to win the race. Years later, team boss Ron Dennis claimed that Hakkinen’s phantom pit stop was the result of somebody hacking the team radio. The order to switch was simply righting the wrong of the pit stop that should never have happened. With Schumacher at home for much of the year with a broken leg, Ferrari’s championship hopes fell to Irvine, with Mika Salo standing in for Michael. In Germany, Hakkinen had been leading when he was put out with a tyre failure. That left Salo - who’d never even scored a podium at this point of his career - in the lead in just his second grand prix for Ferrari. However, it wasn’t his job to win races and with Irvine in second, he had to move out of the way, which he did out of the sight of TV cameras. Irvine claimed victory but gave his trophy to Salo after the race. Schumacher returned to racing with two races left to go in order to support Irvine’s championship bid - a slightly bizarre role reversal for the two - at the inaugural Malaysian GP. Schumacher reminded everyone that he was the true Ferrari number one by taking pole by over a second, streaking off rapidly off into the lead, and then slowing down to let Irvine past. He continued to go slowly hold Mika Hakkinen behind as Irvine built a lead. Schumacher then went so quickly before his final stop that he regained the lead from Irvine and had to slow to let him past again. After the race, Irvine said Schumacher was “not only the best number one driver, but also the best number two’. Funny? Yeah, but with the speed he’d shown, all weekend, you just know Michael was making a subtle point of what he thought about Irvine’s title credentials. Although it was only the sixth race of the year, it was already obvious that Schumacher was going to dominate the entire season. 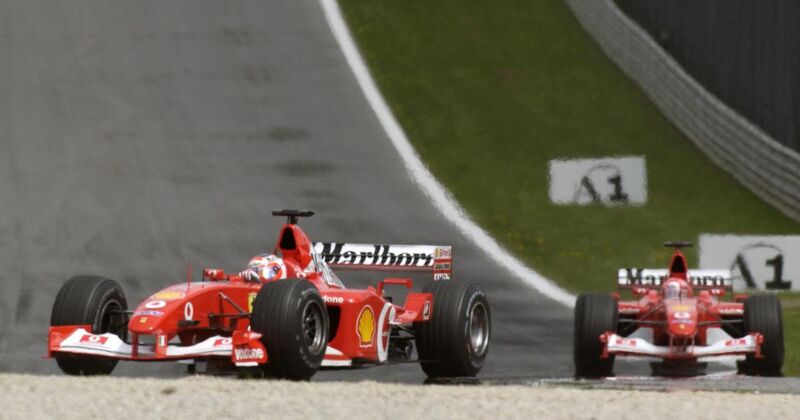 Yet at the A1 Ring, it was Barrichello who took an easy pole and led the entire race with Schumacher running second. A few laps from the end, unexpectedly, the team order came. A furious Barrichello (who’d had to concede to his teammate in the same race the year before) argued for several laps before reluctantly complying. However, he decided to give Schumacher the position exiting the last corner on the last lap. The fans were furious and booed the pair of them on the podium. 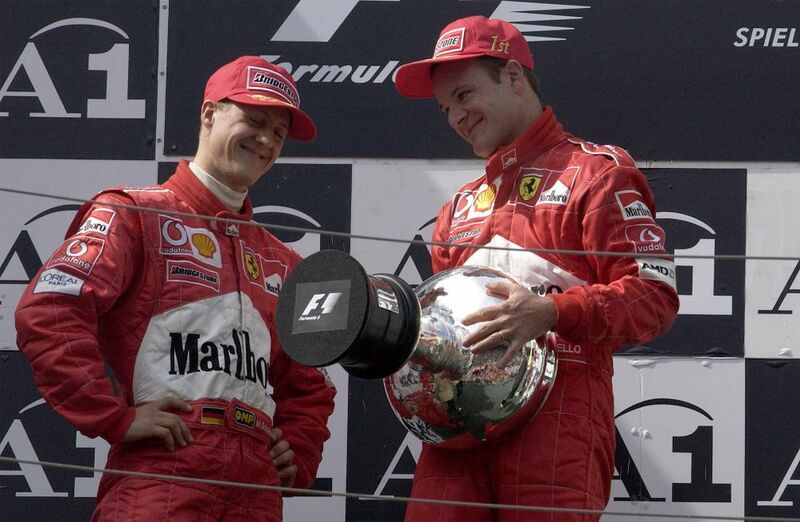 An embarrassed Schumacher pushed Barrichello onto the top step and gave him the first place trophy. As you might expect, the team orders ban did nothing - teams just used codewords to get drivers to swap positions, instead. "Fernando is faster than you." 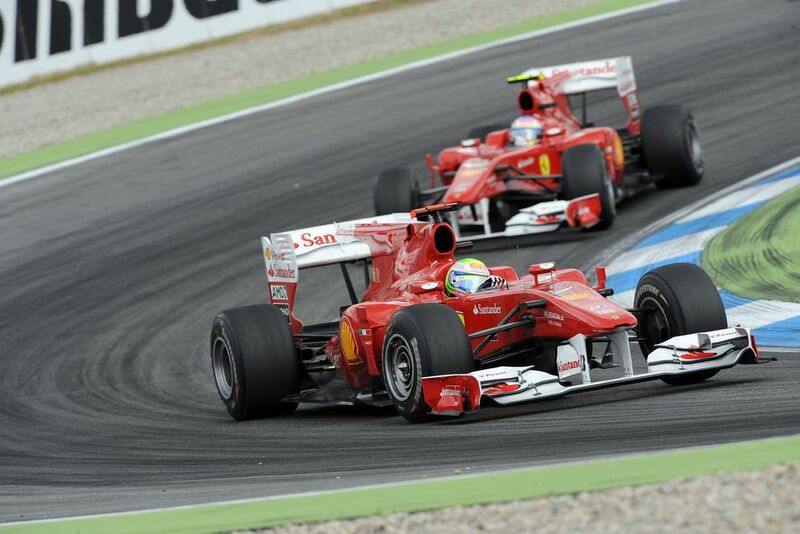 A lap later, Massa slowed, Alonso went ahead and won the race. It was obviously a team order which was obviously illegal and should obviously be punished, but it had happened so many other times up and down the grid that it simply couldn’t be. 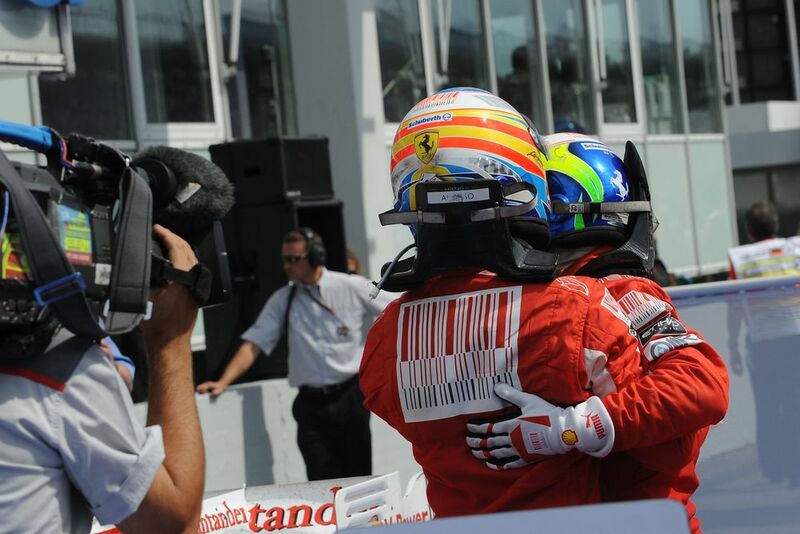 Despite that a variety of penalties were called for, ranging from a time penalty for Alonso to restore the order right through to Ferrari being disqualified from the race. In the end, Ferrari was fined $100,000 and at the end of the year, the team orders ban was lifted as it was essentially impossible to police. What really made the whole thing sting, however, was the fact that the race marked the one-year anniversary of Massa’s life-threatening accident in Hungary the previous year. The win could have worked wonders for his confidence, but it pretty much confirmed him as Alonso’s number two and he never really came close to winning again. Those are all team orders, but there have also been times when drivers voluntarily gifted their teammates a victory. 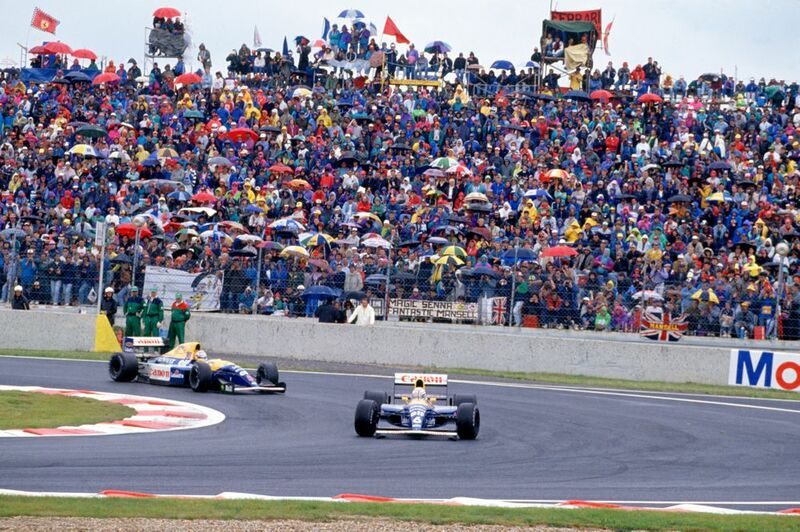 In the 1991 Japanese Grand Prix, Ayrton Senna secured his third championship when Nigel Mansell spun off early in the race. On the final lap, he slowed down and allowed Gerhard Berger to pass as a thank you for his support over the last couple of years. It was a similar situation in the 1983 South African Grand Prix. When Alain Prost’s Renault broke down just before half-distance, Nelson Piquet only had to finish fourth to be champion. To increase the likelihood of that he slowed down to save his car, allowing Riccardo Patrese through to win. In the 1955 British Grand Prix, Stirling Moss took his first victory from Mercedes teammate Juan Manuel Fangio. Whilst the two had swapped positions early on, for most of the race Fangio had sat happily behind Moss, and on the final corner decided to pull alongside his teammate at the finish line. Moss felt Fangio had deliberately let him win and whilst Moss never admitted it, he didn’t exactly deny it either. Will Hamilton return to favour the Bottas later this season? Only time will tell, but given their relationship and the fact that Bottas has obeyed orders this year and been denied more than one win by bad luck, it wouldn’t be a surprise.